OHN returns! The OzHadou Nationals are Australia’s longest running fighting game tournament series and OzHadou’s premier annual event. Final Australian 2016 event in Capcom Pro Tour Asia for Street Fighter V.
Super Smash Bros. returns to OHN with official singles and doubles tournaments for both WiiU and Melee. The first Australian major tournament for Tekken 7: Fated Retribution with arcade setups provided by Bandai Namco. Major tournaments for popular York Street Battles games Mortal Kombat XL and Virtua Fighter 5: Finals Showdown. Large new venue in the Sydney CBD to accommodate more participants and spectators than ever before! OHN features mandatory online registration for all attendees. Registration is now open – visit the OHN registration page to purchase your pass. Competitors that register by July 31st will receive a $10 discount on venue entry and have the chance to purchase an official, limited-run OHN14 t-shirt. To find out more about OHN14 visit the official OHN website and keep up with the latest OHN news here or via the OzHadou social media channels on Facebook & Twitter. This week we’ve added another feature to the OzHadou website: the Bracket Seed Generator (BSG). The BSG is a web resource that can be used to seed elimination tournament brackets. You can find the BSG page in the menu bar under “Events”. Challonge is a great online bracket resource for tournament organisers, providing live, online brackets with plenty of features and a simple web-based interface. Unfortunately Challonge lacks advanced seeding options such as structured random seeding involving player ranks or regions. OzHadou uses the BSG to seed brackets for the OzHadou Nationals and other large-bracket tournaments, particularly those where pools or regional seeding are involved. The online edition of the BSG has been designed with Challonge and mobile browsers in mind. While the BSG is compatible with many browsers we’ve had some issues getting it working in Chrome for mobile devices (desktop Chrome is fine). If you’re having problems in your regular browser please try an alternative and let us know about any issues you’re having. If you’re interested in advanced seeding methods for tournament brackets visit the BSG page and try it for yourself. To learn more about how to use the BSG, hit the jump and read our BSG User’s Guide. (front left to right) bksama and Erkybomb. 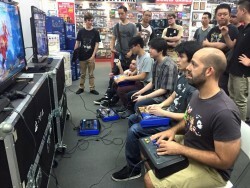 A full 64-player bracket provided a large crowd. Top 8 player robsux (foreground) during pools. Photos are courtesy of tournament hosts The Gamesmen. More photos are available via The Gamesmen’s Facebook page. Update: check out the OzHadou Facebook page for more photos from our Gamesmen SF5 launch tournament. Don’t forget, if you’re still craving Street Fighter V action in Sydney, York Street Battles #39 is on next week and a Street Fighter V tournament will be the premier tournament! 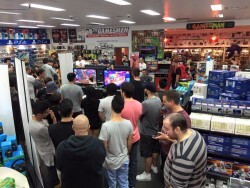 When we called on the community to find out what they’d like to see on the OzHadou website, one of the popular requests was more information about connecting with the various fighting game communities within Australia. With the AU FGC scattered across multiple websites and social media pages it can be difficult for people to track down others who share their interest in particular games or live in the same area. Based on this feedback we’ve introduced new communities pages which can be accessed from the main menu. The default view provides links to Australia fighting game groups and websites divided by fighting game franchises. The secondary view lists groups by region. As you can see from the pages we’ve covered a lot of active groups, but we’ll need your help to keep it up-to-date. If you know of any active Australian groups or websites that we’ve missed, please let us know via the OzHadou Facebook page. 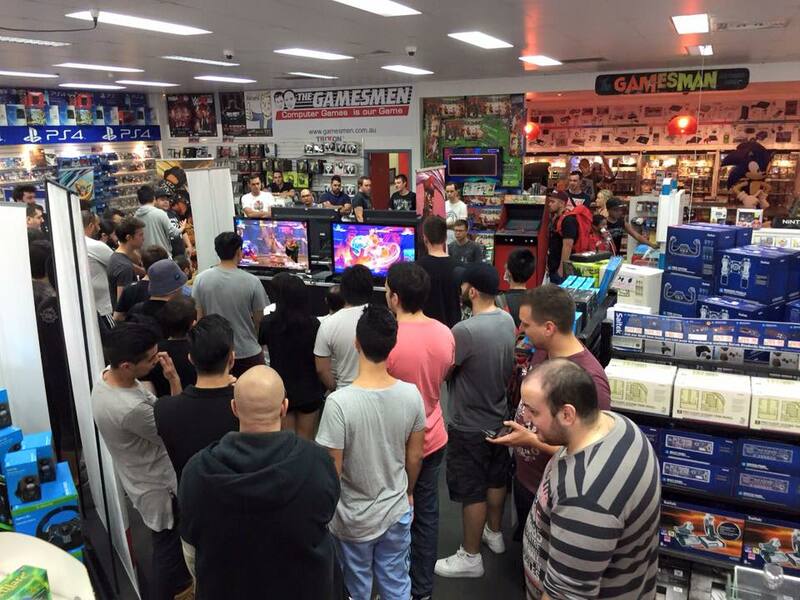 There’s a lot for the Australian fighting game community to look forward to in 2016. Street Fighter V and Tekken 7 are coming to consoles, Button Smash and BAM have been announced and there are plenty of events happening in January. The OzHadou team is also using the New Year to give the website a fresh look and format so that we can better support the AU FGC. In addition to our new mobile-friendly theme, we’re taking steps to retire parts of our online footprint that are no longer relevant. This allows us to redirect our efforts towards activities that better suit the AU FGC of today. Hit the jump for the first big change we’ve made to OzHadou as part of our latest website update. It’s no secret at this point that big changes are coming to the OzHadou website. We’ve been working hard to try and make OzHadou the ultimate hub for everything related to the Australian FGC and we’d like your feedback on what we can do to make it even better. What kind of content do you want to see from us? How do you want to interact with other players? We want to build the best hub we can for you and our scene and we want to know what you think we can do to improve. The survey can be found here, any and all feedback is greatly appreciated! Since its creation in 2001 OzHadou has endeavoured to provide an online hub for the Australian fighting game community. 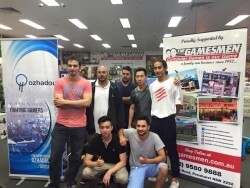 For much of OzHadou’s life the forums have provided a common environment for people throughout the Australian FGC to publish and discuss their news, covering events, tournament results and a wide range of local content and discussions. The OzHadou forum was an ideal shared space when communities outside of Sydney were in their online-infancy. Today the Australian scene enjoys the support of many fighting game clubs and organisations nationwide, each with its own online presence, allowing each group much-needed autonomy. While many of these groups have channels within social media through which members can interact, the dispersion of online portals makes it difficult to track everything the community has on offer. OzHadou is working to consolidate Australian FGC news once more by scouring relevant Facebook announcements and aggregating these here. In this way OzHadou can serve as a jumping-on point for new players and also provide a summary of Australian activity for existing ones. To help us maximise OzHadou’s news coverage we’re asking the community for help. If you have news relating to the Australian FGC that hasn’t been covered here you can email it to us via our new Submit News links. You can find these links in the page menu and under the “Connect with us!” panel.